With a title like “Kalahnikovs and Kush,” it’s hard to imagine that the Chi-town beatsmith, Rediculus wouldn’t bring the heat. Instead of trying to make a tribute to the godfathers of the 90’s, the upcoming producer crafts a track that takes elements of that ol’ Boom bap for the modern day Hip-Hop head. Pulling together the lyrical tactics of Shabaam Sahdeeq, El Gant, Famoso and Bekay (who manages to shave his head while dropping some ODB-esque rhymes), the track is fertile grounds for hot 16s. 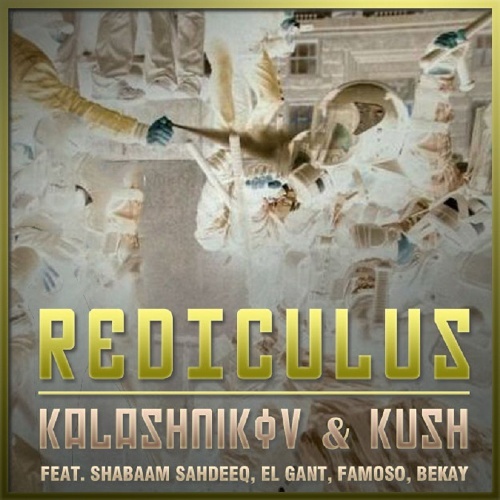 “Kalashnikov & Kush” is the first single from Rediculus’ forthcoming producer compilation, ‘In Response: Dee-Fi,’ so expect more fire in the weeks to come. The album itself features three tracks completely written by Rediculus — “Stay” and “Again,” and two RnB ballads; one featuring industry veteran Jay Hollins, and “Repercussions” which features the upcoming emcee, Jus Daze. Rounding out the collaborative effort is Rediculus’s long time lyrical partner Rich Malone, new comer Fresco, frequent collaborators J57 and Sene, East Coast spitters in Coast, CoalCash and C-Rayz Walz, Comet, Boston up-and-comer Token, and LA wordsmith Aarophat. Keep an eye out for Rediculus and his forthcoming ‘In Response: Dee-Fi’ LP, which is set to be accompanied by five videos and seven singles.